You may have come across this problem; the level of your pool keeps going down faster than you’d expect and you’re not sure if you have a leak. It’s a sad truth that owning a pool sometimes means having a leak either in the pool itself or in the plumbing and filtration system. These leaks can come in three varieties, one that draws air into the plumbing system and two that allow water to leak out of the pool, the first of these being the plumbing and the second being a leak in the pool vessel itself. The main culprits are usually the pipe exits and entries to the pool shell, especially the main drain. 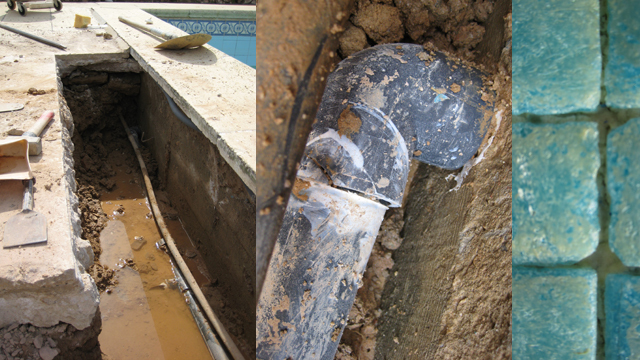 Often in the Algarve the infill around a pool is not properly compacted and when it does settle it destroys the pipe connections. There is a simple test called the bucket test to establish if you have a leak. To keep the effects of evaporation out of this test, fill a bucket with water, mark the level of the water in the bucket, set it on the stairs if possible or suspend from a pole in the water and compare the water loss between the pool level and the bucket level. Once you have established you have a leak we can assess you pool and find out exactly where it is leaking from and propose a solution. We have plenty of experience in pool construction and re-tiling. Obviously you don’t want to waste water, especially if you have had to pay the high charges here in the Algarve, so it is best to deal with leaks early before they cause further damage.